All of our circuit breakers are backed by a full one-year replacement warranty. Buy your General Electric GE SEDA24AT0060 new or refurbished with confidence - we guarantee the breaker to work as new. Don't be fooled, not all circuit breaker dealers are the same. We're one of the pioneers in this industry, having been around for more than two decades, and we've built our reputation around quality products and excellent customer service. The General Electric GE SEDA24AT0060 you receive from us will not only be covered by our standard 1-year warranty, it has been inspected, tested, and is in like-new condition. We guarantee it. Call us up and talk to a live technician for more info, or stop by our shop. If you've found a better price elsewhere, give us a chance to match that price. Please fill out our price match request form and a salesperson will contact you via your preferred method as soon as possible with pricing and delivery information. Please be sure to include the information for the competitor and the price they quoted you for the General Electric GE SEDA24AT0060 and we'll do our best to meet or beat it. Many products we carry are defined as New or Surplus New. Some products are no longer being produced by the manufacturer and cannot be purchased from their main distributors. But since we are able to buy our General Electric GE SEDA24AT0060 breakers outside of the traditional distribution channels, we often locate obsolete products that are found to have not been energized. We put them through the same inspections and testing as our used products and are able to offer them at a greater discount than most other distributors. All items purchased from Bay Breakers, including this General Electric GE SEDA24AT0060, are backed by a solid one-year warranty. Whether it be new, reconditioned, or obsolete, the warranty remains the same. With our in-house testing capabilities, we can assure you the highest standard of quality on every item we ship. 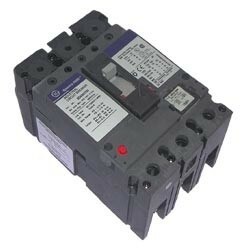 GE circuit breakers are available in countless different configurations, reconditioned and new. We list hundreds of models in our online catalog, including popular models like the THQB2130, TQD22200WL, TED134030WL, SFHA36AT0250, and the SGLA36AT0600, as well as various other models, new, used, and professionally reconditioned. If you're having a difficult time finding the exact part you need, or you're looking for an obsolete/discontinued model that we don't list on our site, CALL US and we'll help you get the GE breakers you need, quickly. Keep in mind that we offer same day shipping and overnight shipping options. General Electric Company (GE) is an American multinational conglomerate corporation incorporated in Schenectady, New York and headquartered in Fairfield, Connecticut, United States. The company operates through four segments: Energy, Technology Infrastructure, Capital Finance and Consumer & Industrial.